Vineyards. Tradition and culture in care. Vine growing method used in the company. Vine growing method used in the company. With particular cultivation techniques, it is possible to modify the growth of the vine. In this way we can obtain different “breeding forms”, in order to obtain a greater quantity and a better quality of the grapes. The method of rearing of the vines adopted by us is called “double Guyot” which consists in the presence of two branches of fruit instead of one. Our vineyards, divided into sangiovese and ciliegiolo, have an extension of about 5 hectares and there are 3800 plants per hectare and each strain has 12 buds. The soil on which they grow is hilly, of medium mixture with a high percentage of skeleton, a very important factor that gives a great freshness to the grapes. The work in the vineyards is carried out with the utmost care, scrupulously respecting the cycles of nature, moreover the company is in biological covers and the fertilization is carried out using exclusively organic substances. All stages of production (vineyard care, winemaking, bottling), are closely followed by Emanuele Papini and mother Sabrina with the advice of oenologist Giacomo Cesari and Attilio Pagli. 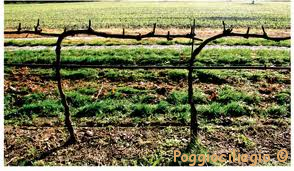 Another solution of breeding of vines that we use only for Sangiovese is called “ spurred cordon “: a few months after the beginning of winter rest, the plant is pruned leaving only one or two branches that will be kept for four or five years, keeping only four spurs equidistant from each other. 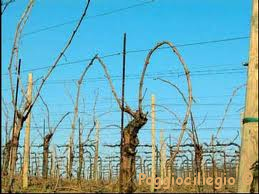 The subsequent prunings will consist in renewing the spur year by year.